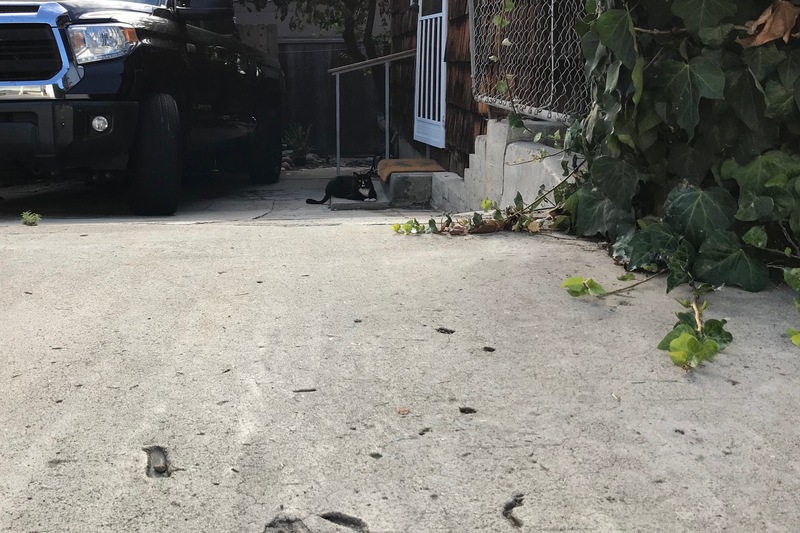 Among the distribution of neighborhood kitties, two color combinations surprise me: White with orange/tan blotches and tuxedo. Hence the nickname for today’s furball. Drop by for the other, tomorrow. I spotted this fine specimen while walking up the Maryland Ave. alley from Van Buren to Meade. At first, I thought that Pepe, who lives nearby where VB meets Cleveland, had gone on an adventure. But after close inspection, on MacBook Pro at home, this fine feline is a different animal. And the other tuxedos: Fraidy, Patience, Poser, Sammy, and Spot. The Featured Image is a near-100-percent crop from an HEIF (High Efficiency Image File Format) original, shot using iPhone 7 Plus, processed in Apple Photos, and auto-converted to JPEG. I should have used the smartphone’s second camera to zoom in. Vitals: f/1.8, ISO 20, 1/669 sec, 3.99mm. Tux and I briefly met on Aug. 14, 2017, at 5:36 p.m. PDT. From the archives: Scruffy, Roly Poly, Woo, Skull, Biscuit, The Colonel, White, Chipper, Frisky, Stretch, Needy, Farfisa, Mates, Hunter, Pee-Pee, Blue, Blue Too, Bonded Pair, Patience, Fess, Jumper, Frenemy, Looker, Cozy, Scout, Lurks, Skit, Mini, Betty, Black and White, Stalker, Bell, Chill, Sammy, Scratch, Poser, Star, Grey and White, Watcher, Herman, Comet, Roman, Willow, Chub, Nimbus, Watson, Lilo, Kit, Pepe, Twilight, Sebastian, Spot, Booger, Ash, Veruca, Riley, Mellow, Bonde, Flower, Glass, Black, BeBe, Fang, Bruce, Siamese, Pounce, Tortie, Haiku, Fraidy, Peso, Daniel Tiger, Dusk, Stride, Dainty, Spry, Tabby, Betty Too, Still, Levi, Shadow, Sophie, Wink, Ferals, Momma, and Charlie.